The clinically advanced and highly configurable CARESCAPETM Monitor B850 helps you stay a step ahead with clinical tools that meet even the highest acuity patient needs. Designed with clinicians, for clinicians, it's an easy-to-use system that fits how you work and handle patient data, offering flexibility, scalability and exceptional customization. Get the monitoring tools you need today, on a platform that's designed for the future. 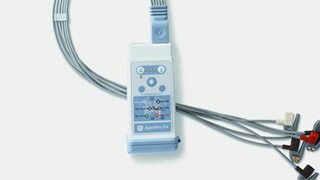 The CARESCAPE* Monitor B850 provides a dependable level of data continuity and integration across care areas. Meet even the highest acuity patient needs and help ensure reliable results at every stage of patient care. Improve patient flow door-to-door while receiving the seamless data flow with CARESCAPE Gateway into HIS/EMR. View data and get clinical intelligence from multiple sources: lab results, medications, MUSE* cardiology information system data, telemetry and more. Connect to displays, printers, recording devices and other monitors for bed-to-bed viewing, or to data management software devices via a network. 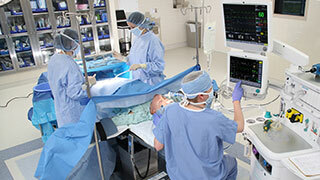 Increase clinical workflow efficiency by customizing alarms to match the procedure or patient needs. Optional ACS mode provides higher sensivity 12SL* analysis for the detection of acute coronary syndrome in patients suspected of acute myocardial infarction or ischemia. Diagnostic quality of 12SL* analysis and automatic, initial interpretation, along with two-way integration to the MUSE* cardiology information system, enable fast, validated access to a patient's 12SL history and serial comparison of cardiac status. 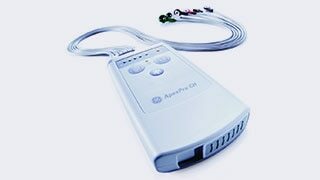 Innovative gas exchange and metabolics technologies, including Patient Spirometry, aid the clinician in optimizing the patient's nutrition, work of breathing and ventilator settings in order to help the healing and weaning process. 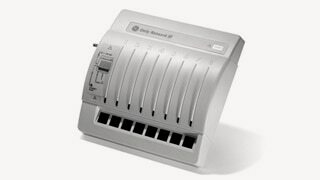 Hardware scalability with parameter modules and a variety of frame, display, and mounting options. 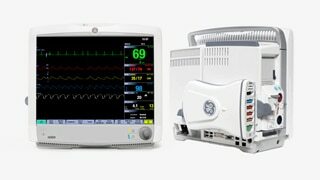 Anesthesia Carestation* solution combines patient monitoring, anesthesia delivery, predictive drug modeling, perioperative imaging and EMR devices in a single, integrated system. 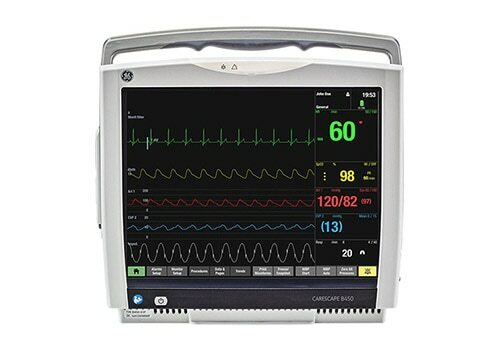 Unity Network* ID, when combined with the CARESCAPE* Monitor B850, allows you to connect to other vendors and selected devices, as well as send data to electronic medical records. Patient Side Module: Enables simultaneous measurement of 3-, 7-, 8- or 12-lead ECG in CARESCAPE* modular monitors, both with ST segment analysis, respiration, pulse oximetry, two temperatures, non-invasive blood pressure and optional two invasive blood pressures (in E-PSMP). E-Entropy Module: Contains GE's unique Entropy* algorithm that monitors the state of the brain. E-COPsv Module: In addition to providing those measurements of the E-COP Module, provides mixed venous oxygen saturation (SvO2). ScvO2 measurement can also be obtained with a separate licence. E-NSATX Module: Oxygen saturation measurement utilizing Nellcor™ pulse oximetry measurement algorithm, based on OxiMax™ Nell™ line technology.